The FAA is getting down to business. We’re not waiting for what’s next, we’re creating it. Safety remains paramount while innovation continues to soar. The FAA is getting down to business while keeping safety the priority. Join 1,000+ attendees from all sectors as we get down to business to address the safety issues facing the UAS industry today. The FAA is bringing stakeholders together from all sectors to help define the rules and concepts that will govern the future of drone operations. Discover how we are working together to establish partnerships and identify the responsibilities, education and tools our partners need to be successful in their roles. Registering and flying your drone has never been easier—or safer. The FAA has cut the red tape and increased efficiencies by streamlining our processes and providing online access to them. Learn all about how we’ve increased our customer service efforts through live, interactive webinars, video tutorials, and social media. Now’s the time to get down to business. 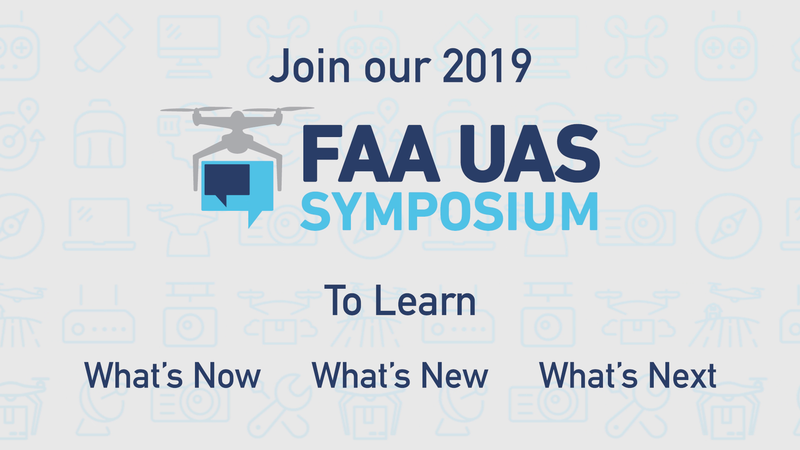 Make sure that you don't miss out on an incredible opportunity to hear from UAS industry leaders as well as the chance to be a part of the engaging dialogue that is sure to happen at the FAA UAS Symposium this year. Special rates are available to all government and active duty military personnel. To register under this category, you must have a .gov or .mil email address. You will need to present a government or military photo ID to obtain your badge and symposium materials. Special rates are available to all public safety personnel. This includes offices of police, sheriffs, EMS, fire service, hazmat and park rangers from federal, state, city, county, campus, and tribal agencies, and members of the armed forces. To qualify, the recipient must work for the government or a public safety agency and will be required to show their credentials upon arrival. AUVSI reserves the right to refuse ineligible registrations. This registration category is for anyone in the unmanned systems or associated industries. Housing information is currently being finalized and will be updated soon. Please check back frequently for more details as they become available. Partner packages are available for the 4th Annual FAA Unmanned Aircraft Systems (UAS) Symposium. Contact Wes Morrison, Senior Business Strategist at AUVSI to take advantage of these branding opportunities. The FAA UAS Symposium provides stakeholders with the opportunity to talk face-to-face with a cross-section of government and industry representatives about regulations, research and initiatives to integrate unmanned aircraft systems (UAS) into the National Airspace System (NAS).